When you have to coin a new genre because you’ve created a sound so indefinable, you’re off to a good start as a band. 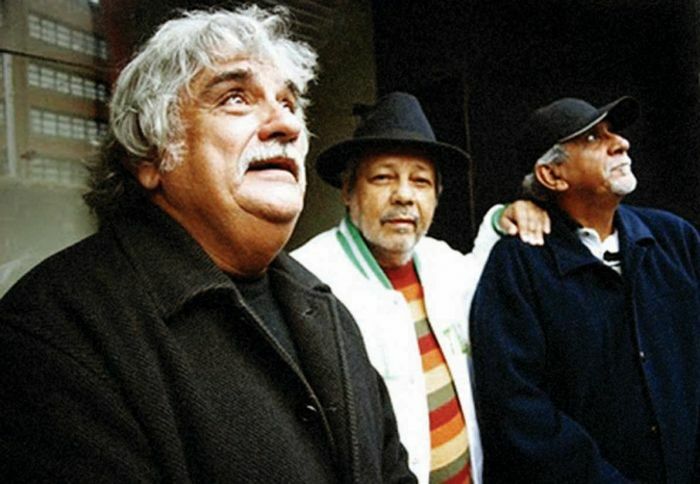 When the originally named Grupo Seleção set out on Rio’s club circuit as a cover band in the early seventies, their heady juxtaposition of mellow jazz funk and vibrant synthesised carnival deserved no other name than samba doido. With José Roberto Bertrami on keys, Alex Malheiros on bass and Ivan Conti on drums, the quirky jazz funk orchestra’s notoriety quickly started spreading across Rio and it wasn’t long before their “crazy samba” started getting them noticed. Having changed their name to Azymuth, a nod to a song by Marcos & Paulo Sérgio Valle, the trio gained national recognition when they worked with the Valle brothers on the soundtrack to Roberto Farias and Hector Babenco‘s O Fabuloso Fittipaldi documentary film about two time Formula One World Championship winner Emerson Fittipaldi, released in 1973. Not only did the soundtrack open up Azymuth to the rest of Brazil, it also managed to catch the gaze of a handful of international record labels and after a brief stint with Atlantic, the aptly named Milestone Records proved to be just that for the band, catapulting them to international stardom. This in turn lead to them becoming the first Brazilian band to register a hit in the UK top 40 with Jazz Carnival in 1979. Having released no less than twelve albums on the imprint, keyboardist Bertrami put the band on hiatus in the late eighties/early nineties but they were quick to pick up where they left off when then signed to Far Out Recordings in 1995. Since then they have continued their prolific output with an abundance of new material released through the label, alongside a slew of remastered re-releases and remixes from the likes of Roni Size, Ashely Beedle, Zed Bias and 4hero. Championed by Gilles Peterson, the trio were invited to his Brownswood basement to record a special live Boiler Room show in the summer of 2013. Sadly, Bertrami passed away three years before he could see his chef d’oeuvre Azimüth reach its 40th anniversary but as Conti noted after his death, “Azymuth was [their]north and [their]unity” so it only made sense to continue what they’ve been doing so well for the best part of half a century. Lifelong fan Fernando Moraes stepped in for Bertrami on keys and has since proved the perfect replacement as the band continue to tour the world with the music they love. Going from very recent past experience of live acts Gilles Peterson champions, (Clap! Clap!, Family Atlantica) this certainly is not to be missed. Azymuth perform at District on March 7.